On emirde yer alan kurallar insan tabiatının bir gereği ve evrensel ilkeler olduğu için sadece Yahudilik’te değil diğer ilâhî dinlerde de söz konusudur. Ana babaya hürmet (Bakara 2/83; İsrâ 17/ 23), insan öldürmeme (Bakara 2/84; Nisâ 4/29; Mâide 5/32), hırsızlık yapmama (Mâide 5/38; Mümtehine 60/12), zina etmeme (Nûr 24/30-31), komşuya karşı yalan şahitlikte bulunmama, komşunun malına mülküne tamah etmeme (Bakara 2/83; Nisâ 4/36; Furkān 25/ 72) gibi hususlar Kur’an’da da yer almaktadır. 1 will be the god other than Allah. 2. You shall not make for yourself idols carved. 3. You shall mention the name of God in vain. 4. You're not doing any work on Saturday. 6. You shall not kill Adam. 9. You shall not make a lying witness. 10. neighbors you will covet nothing. In the verses to recognize gods other than Allah, for parents, relatives, to kindness to orphans and the poor, to say nice things to people, prayer and give alms, do not spill the blood of another, ten of the obligations listed as expulsion from their own citizens, the country orders from some of the provisions of the place It is seen to take. On orders of Saturday outside the bans are common teachings of all the prophets sent the holy book Quran to Muslims is also obligated by such obligations. 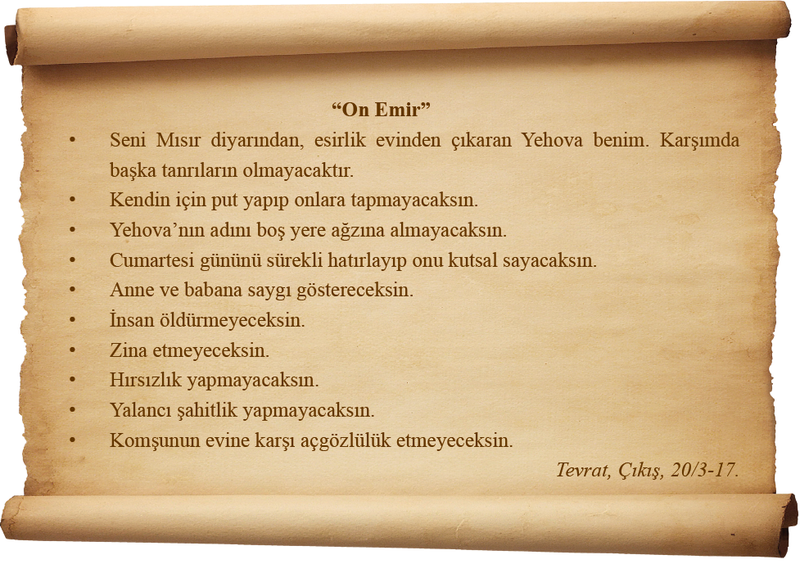 (See, Al-Anaam 6 / 151-153; Isra 17 / 23-39). 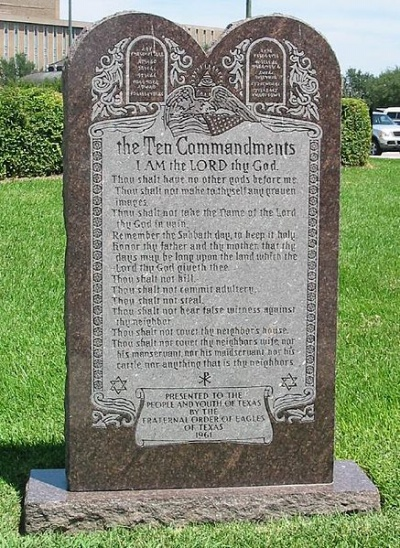 the rules included in the Ten Commandments because a requirement of human nature and the universal principles of Judaism is not only mentioned in other divine religions. Parents reverence (Baqarah 2/83; Isra 17/23), to kill people (Al-Baqarah 2/84; Nisa 4/29, al-Maida, 5/32), theft do (al-Maida, 5/38; Mümteh to 60/12), not to commit adultery (Nur 24 / 30-31), there lies a witness against neighbor to the property shall not covet your neighbor's goods (Al-Baqarah 2/83; Nisa 4/36, Al-Furqan 25/72) as points are located in the Quran.